From Sunstar Americas, GUM Soft-Picks have 76 flexible rubber bristles that easily slide between teeth to remove plaque and food particles, while promoting circulation by massaging and stimulating the gingiva. Ideal for noncompliant flossers and for those with implants, bridges, crowns, and orthodontics, Soft-Picks come in packages of 40 with a travel case. For this Dental Product Shopper review, Soft-Picks were evaluated by 13 hygienists (self- and patient-use), rating such features as comfort and ability to dislodge food. 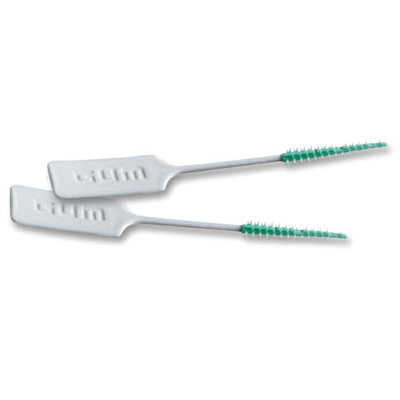 The manufacturer describes Soft-Picks' rubber bristles as gentle and safe for sensitive gum tissue. Twelve hygienists rated comfort as excellent and 1 rated it as good. One hygienist called them "soft yet effective" adding, "I'm comfortable that patients won't hurt themselves." One evaluator called them "very gentle…no sharp edges" and another said, "Everyone said they felt great and comfortable." The hygienist who said "some patients reported some soreness" noted that this was "likely due to inflamed and tender gums…those with healthy gums didn't report any sensitivity." One evaluator "liked the fact that there's no wire" and another found the bristles "so soft and pliable!" The hygienist who "loved the way they felt" in her own mouth reported that 1 patient said they "ease through all my teeth." Designed to be easier than flossing, Soft-Picks' ease of use was rated as excellent by 7 hygienists and as very good to good by 6. One hygienist called them "dummy-proof…very easy!" The hygienist who said "they could be slightly longer and wider" also called the design "very intuitive and much easier than standard picks." Another evaluator said, "You don't have to hold them a certain way to make sure the tip is right-side up." One hygienist reported "slight difficulty from the lingual aspect," and 1 of the 3 hygienists who reported slight or occasional bending said, "Some plastic pieces broke off." One evaluator "couldn't bend it on the white area because it breaks." When compared to flossing, ease of use was rated as excellent by 10 evaluators and as very good by 3. One patient reported "less hassle," another "liked them better but they don't wrap," and a third liked them "when I'm in a hurry and can't floss." According to Sunstar Americas, Soft-Pick's tapered design allows the pick to fit into small spaces. Ability to dislodge food was rated as excellent by 8 evaluators and as very good to good by 5. One hygienist said patients were "happy to have another tool for open embrasures and food traps," and another said patients called them "perfect for on-the-go use after meals." One hygienist said Soft-Picks "removed debris even after I brushed and flossed thoroughly first!" Ability to massage/stimulate the gums was rated as excellent by 9 hygienists and as very good to good by 4. Comments included "wonderful," "nice in open contacts," and, "Patients' gingiva should look much better at recheck because of the massive stimulation." One hygienist said the bristles "felt very good and definitely massaged and stimulated," and 1 patient said they "didn't stimulate but was easier than flossing." All 13 hygienists rated Soft-Picks as much or somewhat better than similar picks, and 11 strongly agreed or agreed that patients would use them more frequently than floss. One of 2 hygienists whose "patients will try anything because they hate flossing" called Soft- Picks "much easier for most" and another called them "small and very discrete." Overall satisfaction was rated as excellent by 7 hygienists and as very good by 6; 10 would definitely recommend them to colleagues and 3 probably would. One hygienist said, "Very easy! Patients love them!"